OnlineCRF is designed to fulfil data collection requirements in clinical projects. It can be used for clinical trials, post-marketing studies, and registries. The electronic data collection (EDC) system comes fully configured and validated according to necessary protocol and CRF. OnlineCRF complies with industry standards like FDA, ISPE, SCDM, and EU. 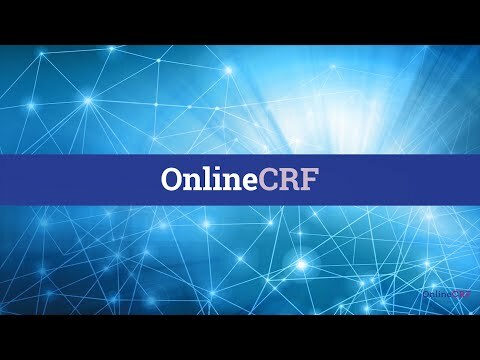 OnlineCRF offers features including authorized access, data pre-validation, AE/SAE reporting, multiple user roles, query generation, randomization, a dashboard to monitor study progress, calculated values, digital signature, audit trails, secured data transfer, multilevel backup, medical hosting, and more. OnlineCRF is a cloud-based system and is accessible through all browser-enabled devices. We used OnlineCRF for randomized non-interventional study. Before we've chosen an EDC system, we looked at several another EDCs. Those EDC systems are a data collection tools which should be configured (visits, ranges, validation rules and other). The fact that OnlineCRF will be preconfigured according to protocol and CRF looked was the main advantage and we’ve came to decision to try OnlineCRF. The personnel requested the Protocol and paper CRF. In a few weeks we’ve got a ready system for collecting data with all the parameters we specified. The interface of the system appeared user-friendly. The program works stably without failures. The project lasted 1 year. So I want to say it's not necessary to be a programmer to prepare a EDC system for collecting clinical data. Instead of wasting time on configuring system according to Protocol and setting up the CRF we delegated this work to OnlineCRF team. We plan to collaborate with OnlineCRF team in the frame of our future project. We didn’t find several type of standard reports. Dashboard live statistics answered only the most obvious questions. We have been using OnlineCRF as a research centre for several clinical trials and can state it is a very convenient and user’s friendly data collection tool. It was very easy to start to work in the system, to pass pre-study trainings and to understand all navigation features making CRF completion process convenient and intuitively easy. It takes less time to feel comfortable in the completion / editing process comparing with other EDC systems we have been using in other studies. The system's interface is easy to work with, there is different reflection modes which are useful to track subject’s completion status what helps to improve quality of our daily activities. We also can note the convenient query resolution module which is effective and comfortable for data entry staff. We used different versions of the system and would prefer to use one with specific module containing study related documents, manuals, disposable forms etc. intended for use by clinical research sites. Pricing is calculated based on study design, visit matrix, study team, and more. Contact OnlineCRF for more information and a custom price quote. • OnlineCRF is a cloud-based system for electronic data collection in clinical trials. • EDC system is fully configured and validated using clinical protocol and CRF. • It has secured access and data pre-validation capabilities to ensure that invalid data does not get saved in the database. • OnlineCRF complies with industry standards like FDA, ISPE, SCDM, and EU. • It offers features like AE/SAE reporting, multiple user and roles, query generation, randomization, and more. Below are some frequently asked questions for OnlineCRF. Q. What type of pricing plans does OnlineCRF offer? Q. Who are the typical users of OnlineCRF? Q. What languages does OnlineCRF support? Q. Does OnlineCRF support mobile devices? Q. Does OnlineCRF offer an API? No, OnlineCRF does not have an API available. Q. What other apps does OnlineCRF integrate with? Q. What level of support does OnlineCRF offer?